Peter David delivers a solid story and script. Veteran Spidey scribe Peter David tells a story about when Peter first brought the alien suit back from Battleworld. 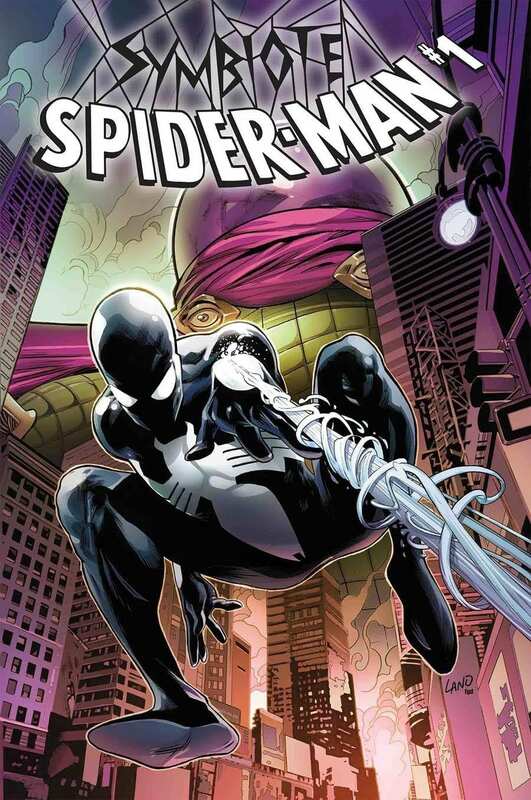 SYMBIOTE SPIDER-MAN #1 pits the wall-crawler against Mysterio. Welcome to a time when Spider-Man and Black Cat were dating, Peter didn’t know his costume was a living alien, and Mysterio couldn’t stomach blood. If this is supposed to be right after Secret Wars, it would be 1984 but it certainly doesn’t look the part. The lack of era identification in this issue is distracting; make up your mind! 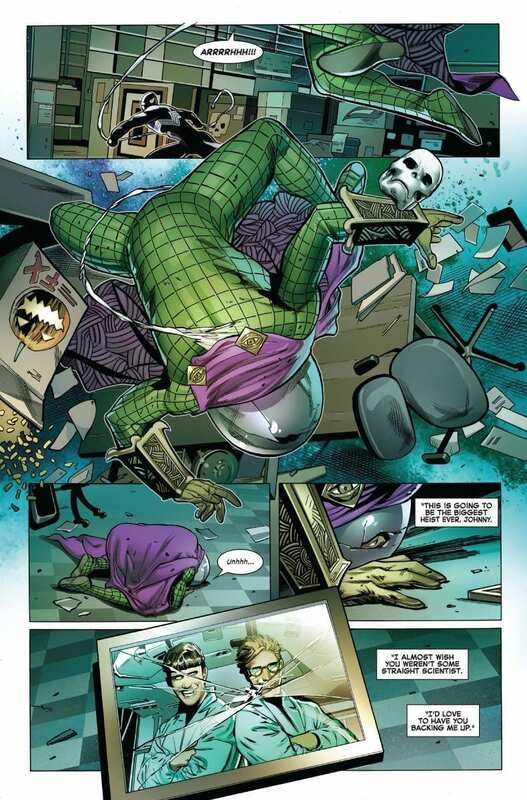 Mysterio plans a bank heist that goes wrong and an innocent woman is killed. Our old pal Quentin Beck (ahead of his MCU introduction in Spider-Man: Far From Home) can’t handle having blood on his hands. This is puzzling given how long Mysterio should’ve been a crook for at this point. Spider-Man is in his symbiote-bully phase and gets a bit too aggressive with Mysterio. Meanwhile, Felicia attempts to appreciate the Peter Parker side of dating Spidey. Writer Peter David is no stranger to web-slingers; his familiarity with these characters allows him to effortlessly jump right into this story. This was a fun time for Spider-Man comics. Symbiote Spider-Man #1 doesn’t just retell an old tale, this is new material. Diving deeper into Peter and Felicia’s relationship is almost always a healthy exercise for creator and reader. 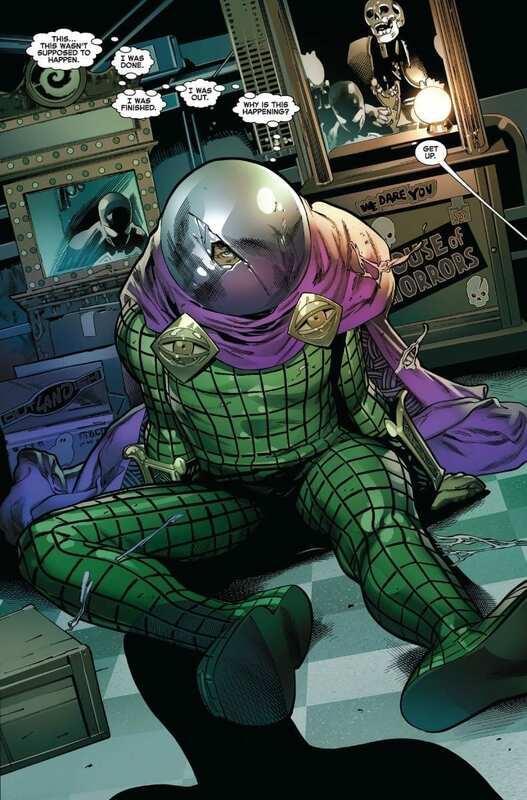 Despite the timeline questions one might have with Mysterio’s development, Peter David creates an interesting dilemma for the master of illusion to deal with. The graveyard scene is fantastic, with Felicia getting stuck with Aunt May alone and their enjoyable banter. Felicia and Peter’s chemistry is also every bit alive as it was back in the era this story takes place. Peter David does a fine job taking us back to a very specific era in Spider-Man comics to tell a very specific story. He does so with the charm and flair that he always features in his Spidey work. 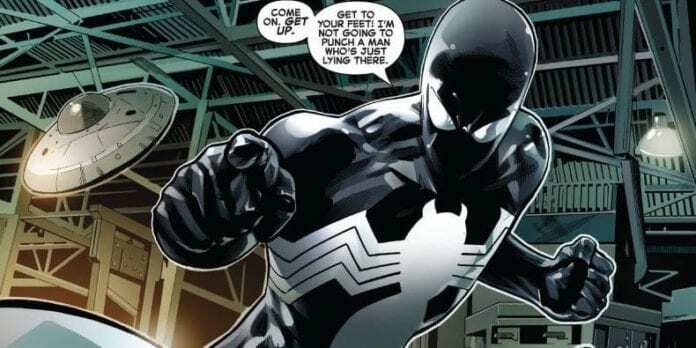 The problem with Symbiote Spider-Man #1 is not the story or script. Greg Land is not a comic book artist with the greatest reputation. At the beginning of this issue, his trademark tracing and recycling are nowhere to be found (or at least hidden well) and it’s quite enjoyable. However, as the issue progresses, it all goes downhill. Starting with the look of Quentin Beck, he’s way too handsome and young and I don’t care if Jake Gyllenhaal is playing him in the movie. It’s also that he looks like completely different people in the beginning and end of this issue. When we start to spend time with Peter and Felicia, the worst of Greg Land’s cliches rear their ugly head. It only gets worse from there as you start to remember these exact images and poses from other books. It makes the enjoyable story feel cheap and thin by proximity. If you don’t have an issue with Greg Land’s work, or have never been exposed to it, Symbiote Spider-Man #1 is an enjoyable trip down memory lane. Peter David’s work on this title will never reach it’s true potential while being dragged down by the distraction and baggage that comes with Greg Land’s artwork. Land’s fully-masked and costumed panels are much less distracting than those with facial expressions. Mysterio and Spidey both look fine during their action scenes, it’s almost like Greg Land is capable of delivering fine art but doesn’t have the time to do so. Spidey’s encounter with The Human Fly is a highlight. It features some great banter, a solid pun, and very little recycled art. If Spidey hadn’t “swatted” the Fly maybe he would be appearing in Nick Spencers current ASM arc “The Hunted. I don’t know what the purpose of this series is, but there’s enjoyment to be found here if you can ignore Greg Land’s art travesties.